This past weekend, I had the chance to visit this year’s Tangible, Embedded, and Embodied Interaction Conference (TEI) and catch up with a number of designers in the human-computer-interaction space. The conference brings together a unique collection of artists, computer scientists, industrial designers, and grad students to discuss computer interactivity in today’s world. Over the span of five days (two for workshops, and three for paper presentations), not only did I witness a number of today’s current models for computer interactivity (haptics, physical computing with sensors), I also witnessed a number of excellent projects: some developed just to prove a concept, others, to present a well-refined system or workflow. It’s hard to believe, but our computer mouse has sat beneath our fingertips since 1963; this conference is the first place I would start looking to find new ways of “mousing” with tomorrow’s technology. Over the next few days, I’ll be shedding more light on a few projects from TEI. (Some have already seen the light of day.) For this first post, though, I decided to highlight two projects tied directly to the conference culture itself. 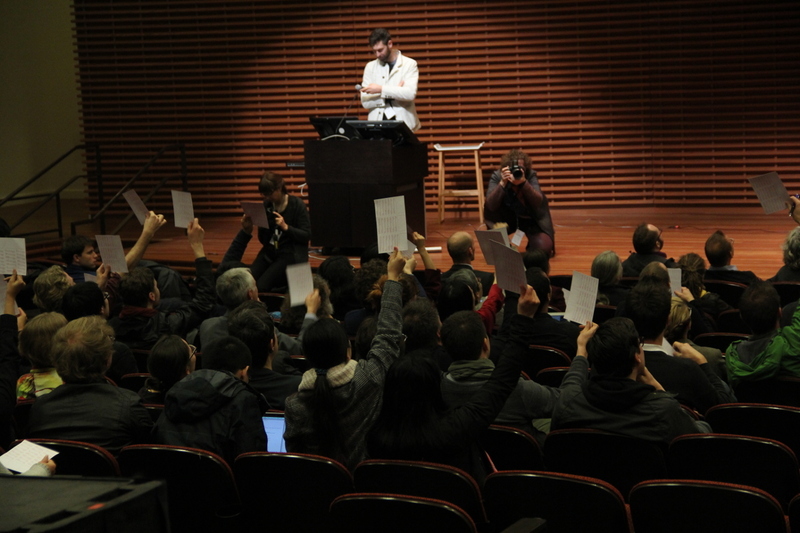 Before each lunch break, the audience was invited to take part in an audience-driven interactive game of “Collective” Pong. With some image processing running in the background, players held up pink cards to increase the height of their respective paddle–albeit by a miniscule amount. The audience member’s corresponding paddle weight was mapped to their respective marker location on the screen (left or right). It turns out that this trick is a respectful nod back to its original performance by [Loren Carpenter] at Siggraph in 1991. With each audience member performing their own visual servoing to bring the paddle to the right height, we were able to give the ball a good whack for 15 minutes while lunch was being prepared. Next off, the conference’s interactivity spread far beyond the main conference room. During our lunch breaks we had the pleasure of discarding our scraps in a remotely operated trash bin. Happily accepting our refuse, this bin did a quick jiggle when users placed items inside. Upon closer inspection, a Roomba and Logitech camera gave it’s master a way of navigating the environment from inside some remote secret lair. Overall, the conference was an excellent opportunity to explore the design space of tinkerers constantly re-imagining the idea of how we interact with today’s computers and data. Stay tuned for more upcoming projects on their way. If you’re curious for more details on the papers presented or layout of the conference, have a look at this year’s website. Holy moley! I was in that audience in 1991. I’ve certainly forgotten more chill stuff from SIGGRAPH than I remember. Now, who was that wacko with the VR headset who tried to play a virtual band? That was really strange. And wonderful. I think this one is RC too. Darren on Need A Small Keyboard? Build Your Own! permakent on Need A Small Keyboard? Build Your Own! Yann Guidon / YGDES liked Horizon. tamagotono liked kicad StepUp: a Seamless ECAD MCAD Synchronization. Yann Guidon / YGDES liked The $50 Ham: Dummy Loads. liebman liked IVAR, the hack rack. David Cruickshank has added Z80 SBC with TEENY 2.0++ System Controlelr to Stuff I'm following. David Cruickshank liked Z80 SBC with TEENY 2.0++ System Controlelr. liebman liked The Rise and Fall of Pulses. liebman liked The $50 Ham: Dummy Loads.